Price: $609 credit, $597 cash! $30 Shipping by UPS Air. NEW VERSION from Heckler & Koch! 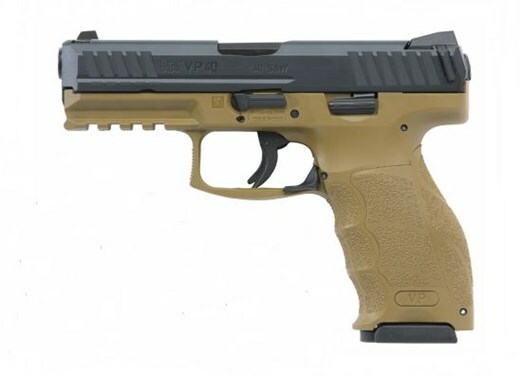 : Since its release in 2015 (2015 Gun of the Year) the VP9 has ben usually called “the better mousetrap” or “better Glock than the Glock” as arguably the best of the polymer frame pistols. 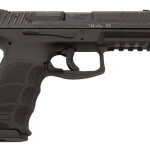 One feature of the VP9, however, was contentious in the USA. The Magazine release “paddle” was not natural to American shooters. 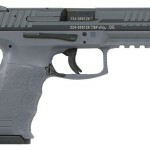 H&K listened and this variant come withs a Push Button magazine release. The VP9-B uses the same H&K’s ergonomic handgun grip design that includes three changeable backstraps and six side panels. Molded finger grooves in the front of the pistol’s grip also instinctively position an operator’s hand for optimal shooting. All controls are completely ambidextrous, slide releases are present on both sides of the frame and magazine release can be easily activated by left or right handed shooters. Pistol features an extended Picatinny MIL-STD 1913 rail molded into its polymer frame for mounting lights and accessories. 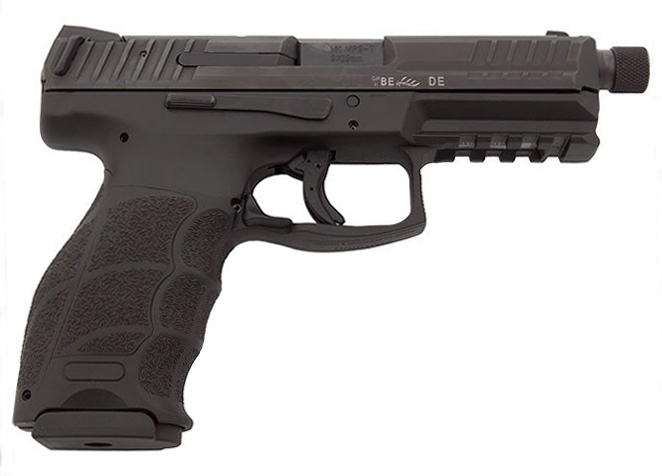 The VP9 uses the proven P30 steel magazine, with 15 round capacity. The trigger has a consistent pre-travel pull with a positive wall/crisp break. Shooter has a less than noticeable pre-travel pull until the trigger reaches the engagement point of the fire control parts prior to trigger break. 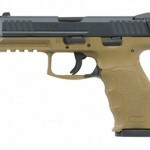 VP9 ships with 2 magazines and has a push button magazine release. NEW from Heckler & Koch! A sub compact version of the revolutionary VP9 now in the “Law Enforcement” (3 magazines – night sighs) version! 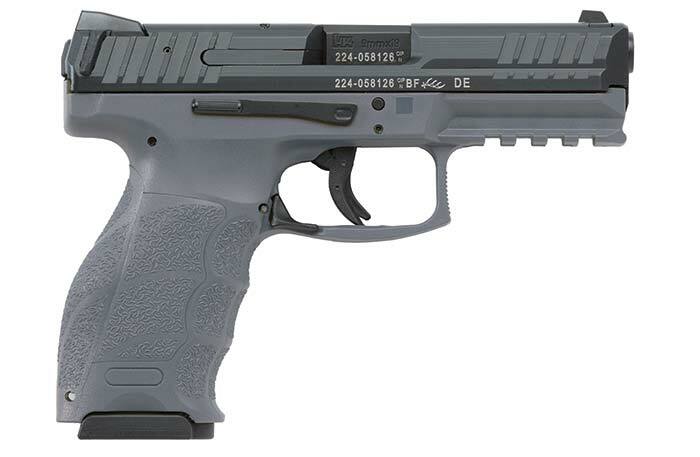 The VP Series is Heckler & Koch’s first striker-fired HK since the P7 series pistols introduced in the 1980s. 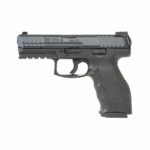 It is well-suited for civilian sport shooting, security, military, and law enforcement use. The VP Series integrates a striker firing system with an enhanced, HK “light pull” trigger. HK’s cold hammer-forged barrel made from cannon grade steel ensures long service life, as does the polygonal bore profile which also provides a slight increase in muzzle velocity. All controls are completely ambidextrous. Slide releases are present on both sides of the frame, and the paddle-style magazine release can be easily activated by left or right-handed shooters. A unique VP feature is HK’s patented rear-mounted charging supports on each side of the slide provide better gripping leverage for racking the slide rearward. The machined steel slide is protected from corrosion and wear by HK’s hostile environment finish and all metal components, including springs and pins have superior metallurgy. VP SK subcompact models feature a more concealable design with a shorter barrel, abbreviated Picatinny MIL-STD-1913 rail, and a compact grip frame which retains the adjustable VP grip feature of interchangeable backstraps and lateral grip panels. SK models can also use a variety of HK magazines – compact double stack 10- and 13-round with flat or extended floorplates, in addition to proven HK P30 steel magazines. This LE model comes equipped with Night Sights and includes one flat base and TWO extended floorplate 10-round magazine (3 magazines total). NEW from Heckler & Koch! A sub compact version of the revolutionary VP9! 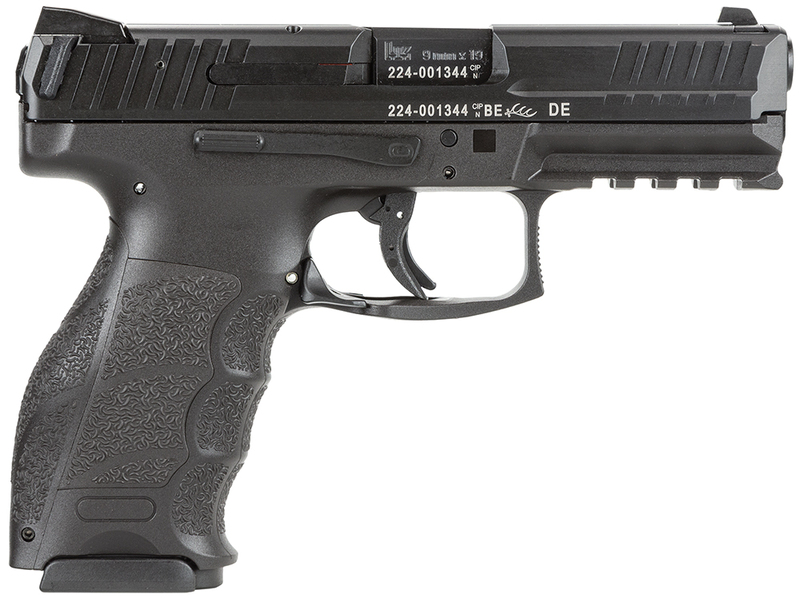 The VP Series is Heckler & Koch’s first striker-fired HK since the P7 series pistols introduced in the 1980s. 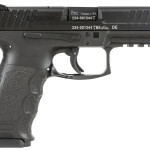 It is well-suited for civilian sport shooting, security, military, and law enforcement use. The VP Series integrates a striker firing system with an enhanced, HK “light pull” trigger. HK’s cold hammer-forged barrel made from cannon grade steel ensures long service life, as does the polygonal bore profile which also provides a slight increase in muzzle velocity. All controls are completely ambidextrous. Slide releases are present on both sides of the frame, and the paddle-style magazine release can be easily activated by left or right-handed shooters. A unique VP feature is HK’s patented rear-mounted charging supports on each side of the slide provide better gripping leverage for racking the slide rearward. The machined steel slide is protected from corrosion and wear by HK’s hostile environment finish and all metal components, including springs and pins have superior metallurgy. VP SK subcompact models feature a more concealable design with a shorter barrel, abbreviated Picatinny MIL-STD-1913 rail, and a compact grip frame which retains the adjustable VP grip feature of interchangeable backstraps and lateral grip panels. SK models can also use a variety of HK magazines – compact double stack 10- and 13-round with flat or extended floorplates, in addition to proven HK P30 steel magazines. This model comes equipped with 3-Dot sights and includes one flat base and one extended floorplate 10-round magazine. Price: $609 credit, $597 cash! Features: Threaded. Night Sights. Intercheangeable Grips. 3 Magazines. NEW from Heckler & Koch – Factory Tuned for Suppressor! : New version with factory installed Threaded Barrel and recoil spring tuned for dual suppressed/non suppressed shooting! The VP9 uses HK’s ergonomic handgun grip design that includes three changeable backstraps and six side panels. Molded finger grooves in the front of the pistol’s grip also instinctively position an operator’s hand for optimal shooting. All controls are completely ambidextrous, slide releases are present on both sides of the frame and magazine release can be easily activated by left or right handed shooters. Pistol features an extended Picatinny MIL-STD 1913 rail molded into its polymer frame for mounting lights and accessories. 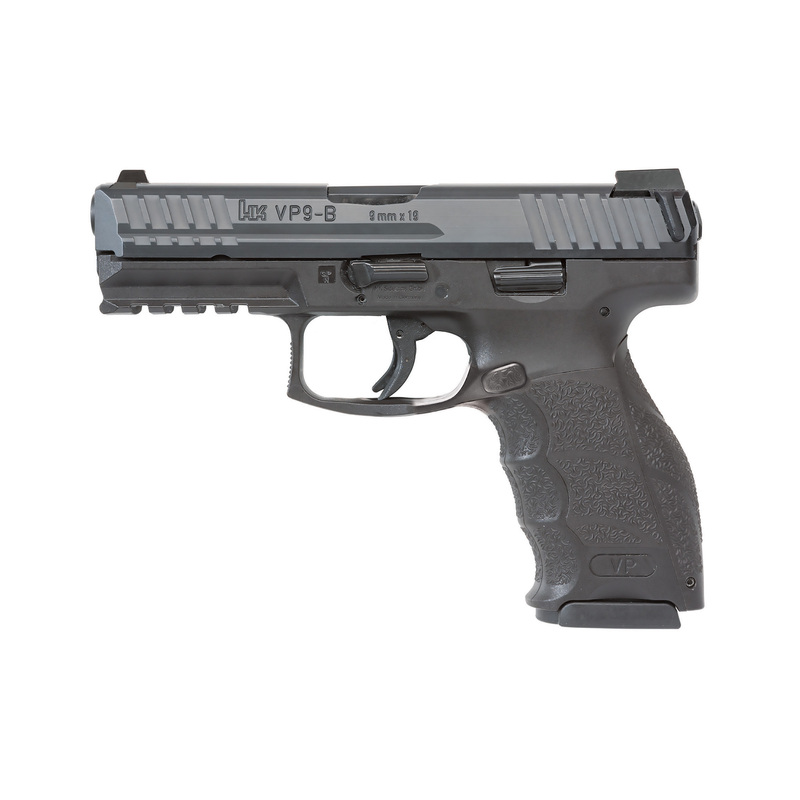 The VP9 uses the proven P30 steel magazine, with 15 round capacity. The trigger has a consistent pre-travel pull with a positive wall/crisp break. Shooter has a less than noticeable pre-travel pull until the trigger reaches the engagement point of the fire control parts prior to trigger break. The VP9 LE ships with 3magazines and Night Sights. Price: $709 credit, $695 cash! NEW from Heckler & Koch! : The VP9 uses HK’s ergonomic handgun grip design that includes three changeable backstraps and six side panels. Molded finger grooves in the front of the pistol’s grip also instinctively position an operator’s hand for optimal shooting. All controls are completely ambidextrous, slide releases are present on both sides of the frame and magazine release can be easily activated by left or right handed shooters. Pistol features an extended Picatinny MIL-STD 1913 rail molded into its polymer frame for mounting lights and accessories. 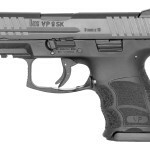 The VP9 uses the proven P30 steel magazine, with 15 round capacity. The trigger has a consistent pre-travel pull with a positive wall/crisp break. Shooter has a less than noticeable pre-travel pull until the trigger reaches the engagement point of the fire control parts prior to trigger break. The VP9 LE ships with 3 magazines and Night Sights. THIS VERSION COMES WITH A FDE (Flat Dark Earth) FRAME! NEW from Heckler & Koch! : Featured in Guns and Ammo September 2014 issue! The VP9 uses HK’s ergonomic handgun grip design that includes three changeable backstraps and six side panels. Molded finger grooves in the front of the pistol’s grip also instinctively position an operator’s hand for optimal shooting. All controls are completely ambidextrous, slide releases are present on both sides of the frame and magazine release can be easily activated by left or right handed shooters. Pistol features an extended Picatinny MIL-STD 1913 rail molded into its polymer frame for mounting lights and accessories. 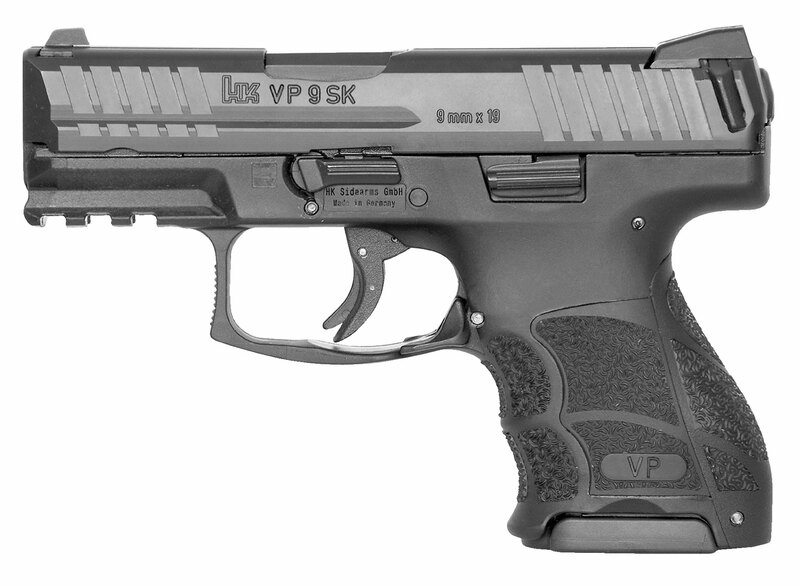 The VP9 uses the proven P30 steel magazine, with 15 round capacity. The trigger has a consistent pre-travel pull with a positive wall/crisp break. Shooter has a less than noticeable pre-travel pull until the trigger reaches the engagement point of the fire control parts prior to trigger break. VP9 ships with 2magazines.